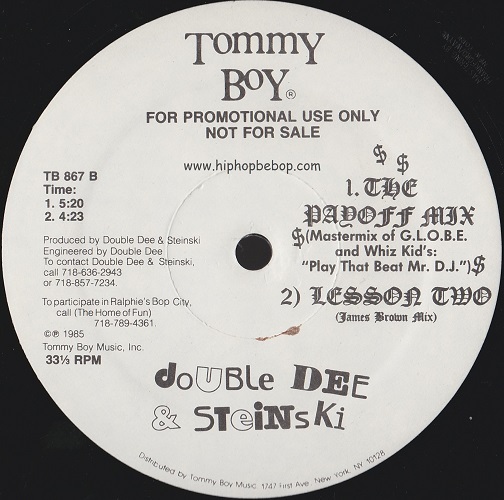 In 1983 Tommy Boy launched a competition officially titled ‘Hey Mr. DJ Play That Beat Down By Law Switch The Licks Mastermix Contest’ to find new remixes of G.L.O.B.E. 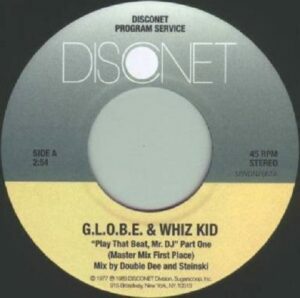 & Whiz Kid’s “Play That Beat” which would hopefully boost sales. 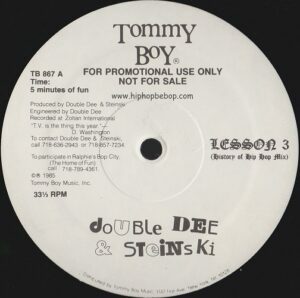 The prize was the complete Tommy Boy catalogue of releases to date, a t-shirt, $100 and the possibility of club distribution and entries were judged by Tom Silverman, Afrika Bambaataa, John ‘Jellybean’ Benitez, Arthur Baker, G.L.O.B.E., Shep Pettibone, Brian Chin, Barry Mayo, Raul Rodriquez, Stephanie Shepherd and Mike Wilkinson. Enter the production duo of Douglas “Double Dee” DiFranco and Steven “Steinski” Stein. 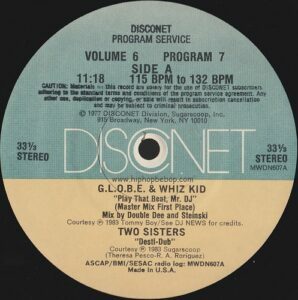 Their sampled based Payoff Remix utilizing elements from a wide variety of sources such as World’s Famous Supreme Team, Funky 4+1, Incredible Bongo Band, Culture Club, The Supremes, Humphrey Bogart, Little Richard, etc was an instant hit and they were awarded first prize. The track was sent out to various radio stations and gained more airplay than the original version. 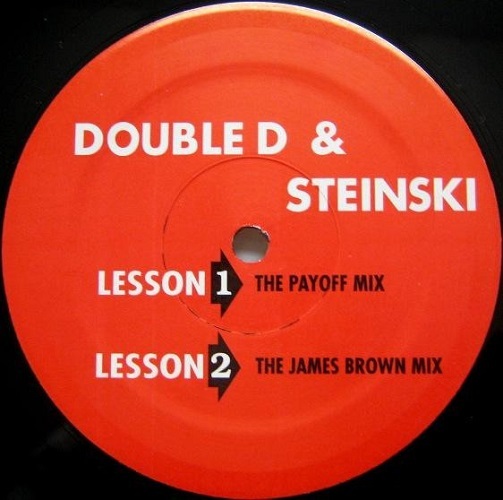 Surprised by the interest around the mix, Tommy Boy suggested a follow-up so the duo went to back to work and followed this track with Lesson 2 (The James Brown Mix). 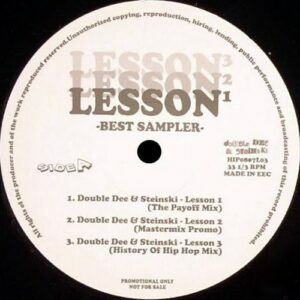 Steven Hager then commissioned the duo to create Lesson 3 (The History Of Hip Hop Mix) in order to promote his book entitled ‘An Illustrated History Of Hip Hop, Breakdancing And Graffiti’. 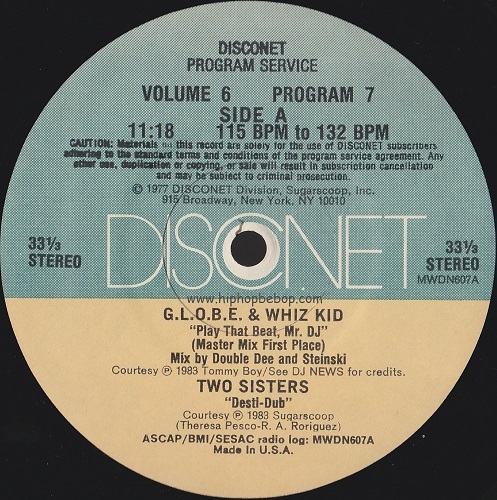 The first appearance on vinyl was on the Disconet Program Service DJ subscription label (Volume 6 Program 7 1984). 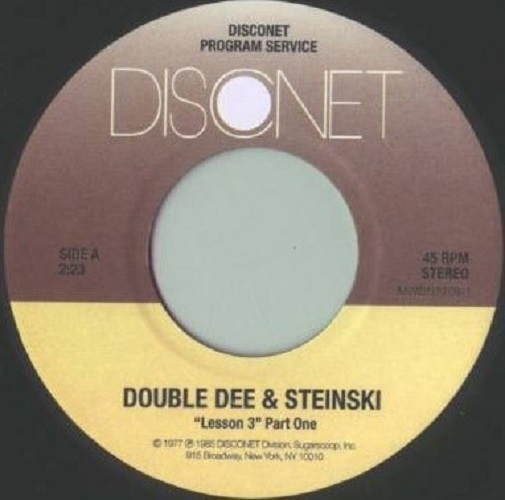 Lesson 2 also featured on a volume of this DJ subscription service label (Volume 6 Program 11 1984) before the duo released a private press of their own containing their first two mixes. There were 500 copies in total which they sold ‘under the counter’ and in person. 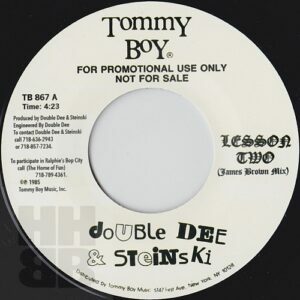 Lesson 3 also appeared on Disconet (Volume 7 Program 9 1985) but this time was closely followed by a Tommy Boy pressing of all three mixes. They intended to officially release Lesson 3 as the A side and include the previous Lessons on the flip and so needed to clear the samples. As the mix was based mainly around Herman Kelly & L.I.F.E.’s “Dance To The Drummers Beat”, they went to Herman Kelly for sample clearance but he refused unless they paid a huge amount of money so the pressing remained a promotional only release. 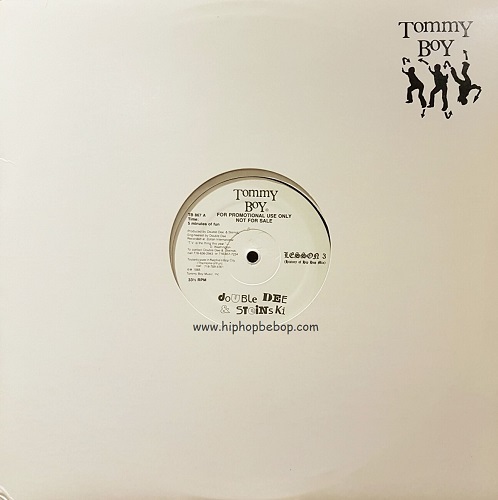 There were various bootleg copies pressed with the Tommy Boy label which can be easily distinguished by checking the runout groove. The original must have a Frankford Wayne stamp. If there’s no stamp then it’s a bootleg. There is one unofficial pressing which has the same mastering engineer’s etching, Herbie, but the F/W is absent. Most other bootlegs can be easily distinguished as both sides are printed as A sides. Some are even pressed at a slightly slower speed. 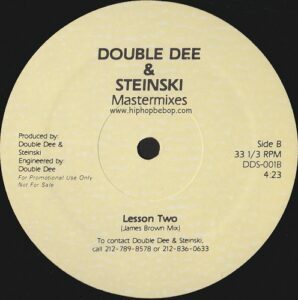 Another thing to note is that due to the lower carbon content when manufacturing the vinyl, some original promo pressings look as if they are pressed on coloured vinyl when held up to the light. 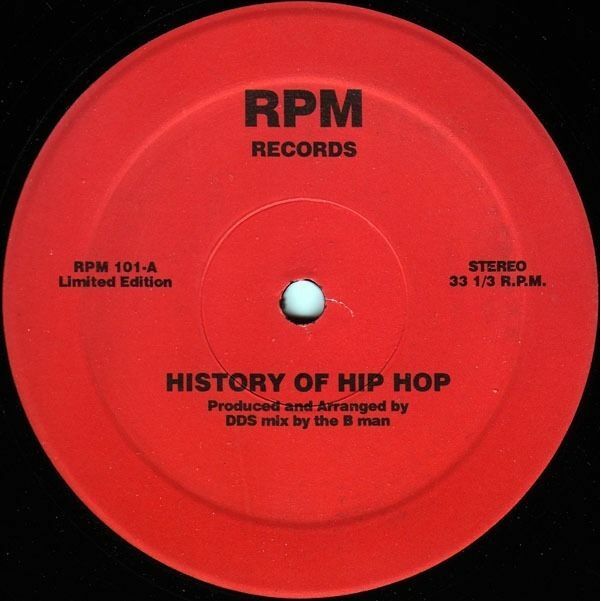 The most common pressing at the time was a red label BPM bootleg with one large press ring which itself has been bootlegged entitled The History Of Hip Hop and since then there have been a number of unofficial releases which are pictured below. The later RPM bootleg is easy to spot as it has an additional small press ring. There have been a variety of bootlegs over the years, some of which are pictured below, but the only official reissue to date is a promotional only release as B side to Afrika Bambaataa & The Jazzy 5’s “Jazzy Sensation” as part of the Tommy Boy’s Greatest Beats series. The record also features a Double Dee & Steinski remix of “Jazzy Sensation”. 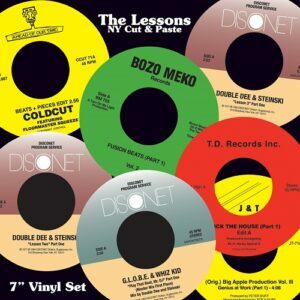 In 2008 there was an unofficial 7″ box set called The Lessons (NY Cut And Paste) which featured all three mixes as seperate 7″ singles with parts 1 & 2 of each track. 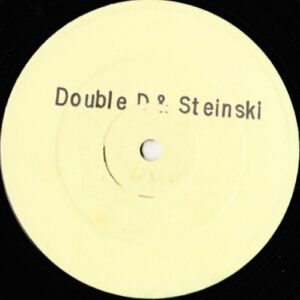 Shortly after the release of the box set all the 7″ singles in the set were also available individually. 2017 also saw the release of a bootleg 7″ containing Lessons 2 & 3. 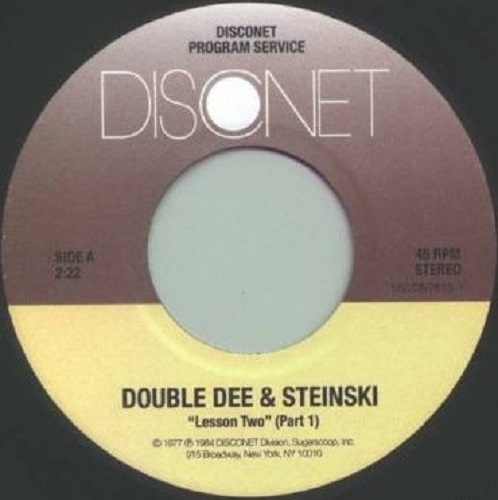 First time Lesson 1 appeared on vinyl. 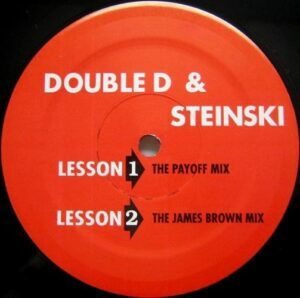 One good thing about the unintentional “colour vinyl” is that you know it’s original. Lesson 3. Tommy Boy promo only. Lesson 1 & 2 on the flip. Original RPM bootleg. Some have Made in Canada on the bottom. 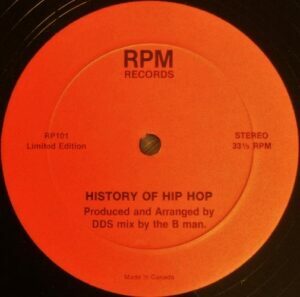 Bootleg of the RPM bootleg with 2 press rings. 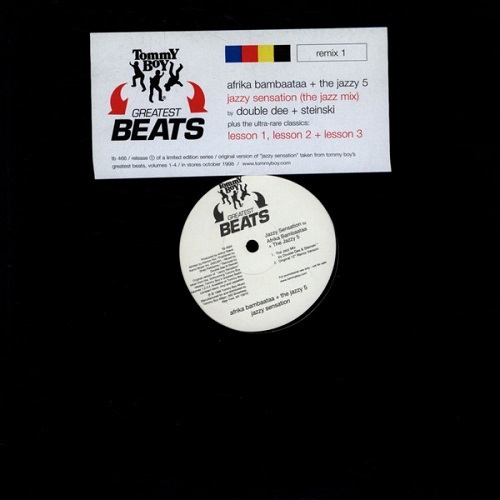 Greatest Beats promo only official reissue. Unofficial 7″ cut & paste box set.